If you’ve broken one too many lamps playing indoor fetch with your dog, or you’re sick of chasing after lost balls when playing outside, check out the iFetch. It was created by a family of inventors…literally. Denny Hamill and grandson Grant are the primary designers. The iFetch doesn’t exactly make playing fetch easier, but it does add a “whole new aspect of fun,” according to the pitch in their Kickstarter video. It’s built for small to medium dogs, whose general spazziness could make training difficult. If you have a small dog with seemingly endless energy, however, it would probably make the little guy very happy. 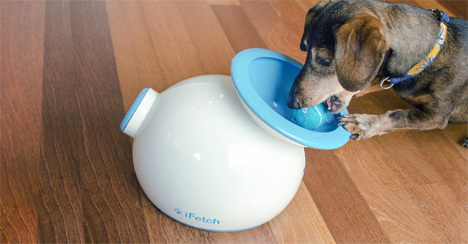 The iFetch can run on batteries (for outside play) or be plugged in. For those who feel the need to add something different to playtime with their dog, the iFetch is for you. If nothing else, watching Beaker the Miniature Dachshund play with it sure is cute! See more in Various Gizmos or under Gadgets. June, 2013.